Cabish then sprinckell alitell rose watter upon the beats in the dishe with a good quantity of sugar and so serve it up to your table. 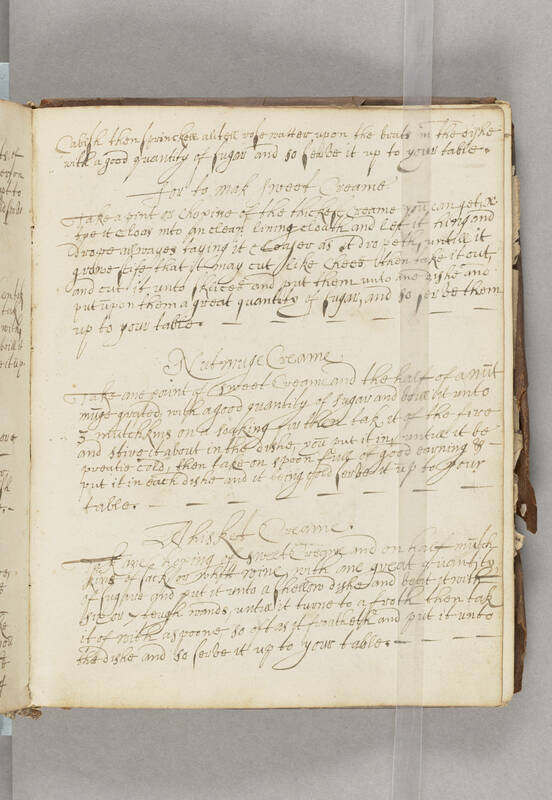 How to mak Sweet Creame Take a pint or chopine of the thickest creame you can get, & lye it cloas into an clean lining cloath and let it [illegible] and drope allwayes laying it [cloaser?] as it dropeth, untill it grone stife that it may cut like chees, then take it out, and cut it unto sleices and put them unto ane dishe and put upon them a great quantity of Sugar, and so serve them up to your table. Nutmuge Creame Take ane pint of sweet Creame and the half of a nutmuge grated, with a good quantity of sugar and boill it unto 3 mulchkins on a soaking fir then tak it of the fire and stire it about in the dishe, you put it in, untill it be preatie cold, then take on spoon full of good [illegible] & put it in [illegible] dishe and it being cold, serve it up to your table. Thisket Creame. Take ane hoxing of sweet Ceame and on half mutchkins of Sach, or whitt wine, with one great quantity of Sugar and put it unto a shellow dishe and beat it with six or 7 [bough?] [wands? ], untill it turne to a froth then tak it of with a spoone, so oft as it froateth and put it unto the dishe and so serve it up to your table.